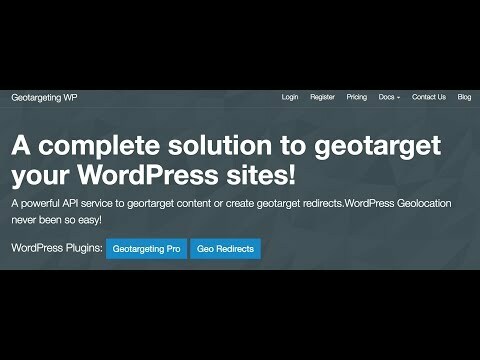 GeotargetingWP is a content geolocation API service for WordPress which allows users to accurately market based on location. The platform offers four different WordPress plugins that will help organizations geotarget their audience in different ways. Great plugin. Works very well as advertised. Easy to implement. It is a pretty easy to use and setup plugin for Wordpress. There's also a free tier which is really useful for me when making the decision to purchase the product.High accuracy of geo-targeting content to the right audience from the right country. The plugin extends beyond just post and pages, it appears in other plugins as well. The pricing model based on and API call is a fair one as the are quite aggressive in caching location of the client to make sure no extra calls to the API is made. Personally tested this myself while in different countries. High accuracy of geo-targeting content to the right audience from the right country. The plugin extends beyond just post and pages, it appears in other plugins as well. The pricing model based on and API call is a fair one as the are quite aggressive in caching location of the client to make sure no extra calls to the API is made. Personally tested this myself while in different countries. This plug-in has been crucial in powering my business. Super straightforward to implement and use day-to-day. I recommend this plug-in to anyone who needs to geo-target their content. Nothing really, although it does seem that quite a few of the nice-to-have features are under paid plans, but that also makes sense to support the software. Fast and east using, hope on the future will have more option than and if so will be great for users. It works really well, the support has been excellent. I searched hard and couldn't find any decent alternatives. If the plugin breaks then it doesn't look great on the website - the geotargeted text disappears altogether, which isn't ideal. GeotargetingWP offers an API pay as you go system where users can buy credits starting at $5 USD which equals to 1000 credits. The solution also includes free plugins with limited functionality where users can have a taste of what GeoargetingWP has to offer. The API is ideal for showing different content or redirecting the users to the proper pages, and allows users to hide products depending on the user’s country, city or state. GeotargetingWP helps businesses target clients accordingly to their countries or cities and show the best and more profitable bonuses. Group countries or cities to create regions in order to make it easier to target users, and use those names in shortcodes or widgets to save time. With AJAX mode enabled, all filters, shortcodes and geotargeting options will be loaded after the page is rendered from cache. GeotargetingWP offers lots of options to personalize the business website based on user location. Below are some frequently asked questions for GeotargetingWP. Q. What type of pricing plans does GeotargetingWP offer? Q. Who are the typical users of GeotargetingWP? Q. What languages does GeotargetingWP support? Q. Does GeotargetingWP support mobile devices? Q. Does GeotargetingWP offer an API? No, GeotargetingWP does not have an API available. Q. What other apps does GeotargetingWP integrate with? Q. What level of support does GeotargetingWP offer?